The slender shapes and the transmission characteristics of the Neumann KM 184 make the "Series 180" especially suitable for a very wide range of tasks in the radio and television sector. 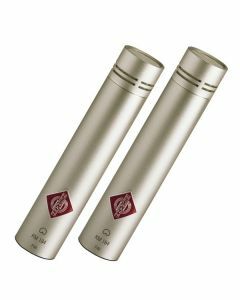 The KM 184 condenser can trace its roots back to the enormously successful KM 84, a microphone successful in becoming a market standard in essentially no time at all. The pressure gradient transducers KM 184 include very smooth frequency responses not only for the 0° axis, but also for lateral (off-axis) sound incidence. In the diffuse sound field it enjoys a flat frequency response and, during standard usage, there is no colouration of sound over a wide pickup angle. The KM 184 also has a gentle rise at about 9 kHz, a characteristic that was introduced very successfully with the KM 140. The result is a tonal balance that is fresher and livelier when compared to the KM 84 with its flat frequency response in that band.